ANGEL BLACK is a four-piece band from Phoenix, Arizona. The lineup features John Cason (vocals), Mike Jelinek (guitars), Carl Strohmyer (bass) and Daniel Beck (drums). 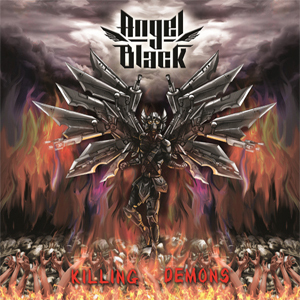 Their debut album, Killing Demons, is set to be released on March 22nd. “Strikeforce” is a very strong opening track that goes right for the jugular. This riff reminds me a lot of Tony Iommi and leaves the listener wanting more. And you get more with the invasion of privacy themed “Cyber Spy”, certainly a nod to JUDAS PRIEST tracks like “Electric Eye” and “The Sentinel”. Jelinek’s heavy riffing, combined with Strohmyer’s bass, makes for a deadly combination. Third track “Death Mill” is the epic here, a moody rumination at nearly eight minutes in length. It features a kind of “Before The Dawn”-style intro before launching into a mid-tempo pace for the rest of the song. A really cool performance video was made for “Black Heart”, (video on KNAC.COM HERE) one of my favorite tracks on the album. Next up, the title track “Killing Demons” races along with Cason’s vocals high in the mix, and another heavy riff from Jelinek, who also lays down a nice lengthy outro solo. “The Dream That Stood Alone” is the catchiest song on the album, and will have you banging your head along with the rhythm and singing along with Cason. “Killing Me” is another mid-tempo rocker, with a very enjoyable refrain. The album is rounded out with a cover of JUDAS PRIEST’s “Metal Gods”, which fools you at first with a “Holy Diver”-ish intro before turning into “Metal Gods”. This is a good cover of the song, even kicking the heaviness up a notch. ANGEL BLACK and their debut album were both a breath of fresh air for me. In an era of homogenized sound and every song streamlined to sound the same, Killing Demons impressed me with dynamics, heavy riffs and soaring vocals. These are four veterans making music the right way, and I look forward to hearing more from them. Killing Demons has eight songs, at 42 minutes in length; a solid debut!